Long distance train travel with a bicycle in Germany normally means changing trains more often than you would do without a bike. It can be stressful and hard work. Few long distance trains in Germany take bicycles because the "Fat Controllers" of Deutsche Bahn (DB) are worried about the time it takes for cyclists to remove their steeds from ICE - high speed trains and the space bicycles take up. Bicycles are not allowed on these fast trains, which make up the majority of long distance trains in Germany. Some slower long distance trains do take bicycles, as do regional trains. The latter are specified and subsidised by provincial governments who are interested in encouraging cycle touring, so most German regional trains take bikes. When you book your ticket with DB the route seems to be planned so you travel the maximum distance on DB long distance trains. What this means is that unless you are lucky, a cross country journey will not be the most direct route, but involve hopping from regional to long distance trains and back again. Fortunately DB issues you with a detailed plan of where to change and from what platform. (http://www.bahn.de/i/view/DEU/en/index.shtml) However this list omits to tell you how to get from one platform to the next, usually within five to ten minutes. Obviously if you just have cross from one side of an island platform to the other, it is easy. OK you might have to run from one end of your train to the other end of your connecting train, but see this as a little morning exercise, provided free of charge. If you have to change, say, from platform 1 to platform 3 you will need to cross the lines, i.e. descend to an underpass or climb a bridge. In larger stations there are lifts/elevators, but these can be very narrow and cause long queues of impatient cyclists, pram pushers, wheelchair users. In smaller stations or if the queue is too long the only option to descend to the underpass is via a flight of steps. This can be difficult, if the train was full of other passengers hurrying to catch their connection and the cyclist is not a well trained weight lifter. A laden touring bike is difficult to carry down and up a flight of steps. There is a cure to the problem and German station designers only have to travel to Switzerland to experience this. Swiss railway stations have ramps to the platforms. They are simple and effective and they don't break down. Why few ramps in Germany? Too low tech or maybe they might take up space that could be used for yet another cafe, hamburger joint and shop selling pots and pans. The next problem comes when the train arrives. You have two minutes to get yourself, bike and baggage on the train. Sometimes other cyclists are descending. Sometimes you need to carry the bike up a flight of steps resembling the Eiger North Wall. It pays to take your panniers off the bike and if you are not on your own, work as a team. Once you get on board, you need to find your bike slot where you might have to hang your bike from a hook or slot the front wheel over a lower hook. Fat MTB tyres can be a problem in both cases. 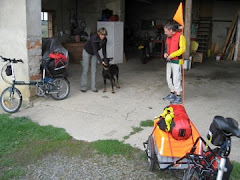 Although there are some stressful aspects to travel with trains, on the other hand you meet other cyclists who are very helpful in our experience. It is an all hands to the pump situation. In our experience German Railway employees are also helpful as well.